If you run a martial arts club or train at home, you’ll know how important it is to keep safe and injury free. As much as floor matting is important to soften your landing, wall mats are often required too to protect students and practitioners from injuring themselves when training. This is especially relevant in grappling arts, such as BJJ and wrestling, as well as throwing arts such as Judo and Sambo. 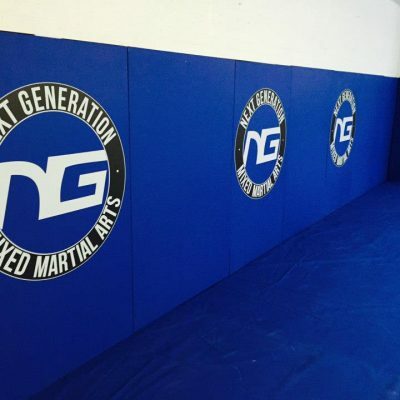 MMA Matting are proud suppliers of wall padding in the UK, having supplied countless martial arts dojos, clubs and home setups with great high quality wall padding and wall mats over the years. We manufacturer all of our MMA wall mats at our factory in Greater Manchester. We use only the best quality foams and materials to ensure a great, long-lasting product. Our wall padding can be fixed to a wall by 3 separate methods: adhesive fixings, Hook and Loop fixings or a Plywood Backing. Whether you need wall padding for gyms, sports halls, your garage, room or dojo, our foam wall padding panels are suitable to keep your students protected when training. Discounts are available for bulk orders. Why not reinforce your branding by having your club logo printed on the wall mats for a truly bespoke training space. You can have your logo printed on however many wall mat panels you require. Should you have any further queries about our martial arts wall padding, contact us today.